An invoice is used to document sales transactions. It includes a list of products, services, due dates, quantities and related pricing information. An invoice is a powerful communication tool to ensure timely payment, make a final good impression on clients and set the stage for long-term business relationships. Make an Invoice - It's Free! 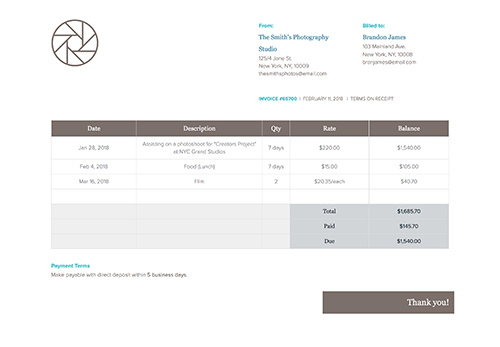 Your starting point to create and share a professional invoice, without any design experience. Did you know? Some people buy vintage invoices online. Seriously, it’s a thing. Make a beautiful invoice that you would want to go back and frame in the future for some time-travel to your company’s history (or to sell, who knows). When making an invoice, it’s important to clearly explain who is requesting payment (i.e. list the necessary information about your company). Add your logo, state your legal company name, company address, phone number, fax number (if applicable), and email. Unlike many other business documents used in sales and marketing, invoices don’t include a company ‘about’ section or a brand tagline. If you want to keep your invoice professional, include only the necessary amount of information. That being said, your invoices don’t have to be boring either. Pay attention to details and show your brand with a custom design! 2. Who is the invoice for? After mentioning the details about your own company, state the information about the person/company which the invoice will be billed to. One of the significant elements of a proper invoice is to differentiate the payer and the payee in clarity. Quick Tip: Be extra careful with spelling when it comes to making an invoice. Double check names, addresses and emails to prevent any mistakes. No one likes seeing their name misspelled, especially when someone wants payment from them! Aside from clearly stating the payer and payee details, you need to indicate dates and a unique identifier to ensure timely payment and make it easy to organize invoices. Quick Tip: When it comes to organizing and recording invoices, it’s very important to have a different invoice number for each document. This makes communication about payments with clients a lot easier. Instead of saying “the invoice I sent last week” it’s more professional to refer to the invoice number. Are you a freelancer providing a service? Did you have any additional expenses (food, travel, etc) that went along with the gig? 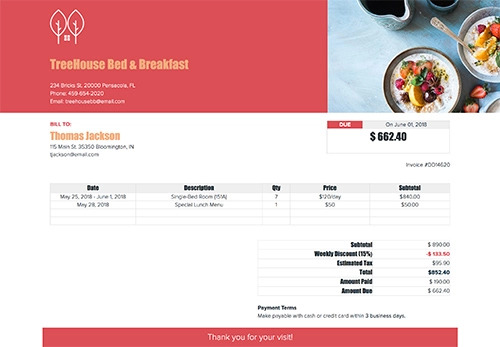 Are you creating an invoice for a guests stay at your bed and breakfast? List the nightly room rate and any additional services or paid goods the guest used during their stay. List each element of your invoice separately and in detail. You need to indicate any other fees or factors that will be added to the total at the end of the invoice. This may include discounts, taxes based on the state/country you’re in, service fees or other additional fees that aren’t included in the invoiced items but will be added to the total. The amount that is expected to be paid needs to be stated for both you to record and your client’s reference. To calculate the total amount due, list the discounts (with a “-” before the discounted price), fees and taxes under the subtotal of all invoiced items and add them up. Always double check the total amount before sending to make sure your calculations are correct. How many business days does the payer have to make payment? How should payment be sent (check, cash, credit card, direct deposit)? Do you accept payments through PayPal or any other online services? Are there any other specific terms that should be mentioned? For direct deposits, you should also mention the address connected to the bank account. For online payments, you might be using a different email address that wasn’t listed before. Use the address field under the “Payment Terms” to give details. 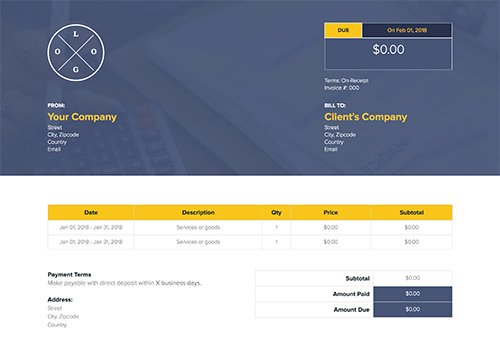 When you’ve finished creating your invoice on Xtensio, you have dynamic outputs for sharing it with clients. You can send the live link to your folio to share it as a responsive webpage (and add password protection) or export a PDF to mail to a client. 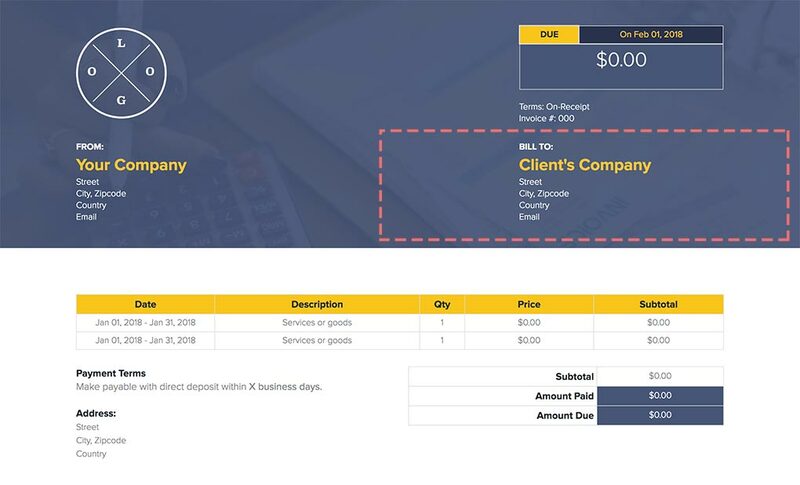 The invoice template is adaptable just like other Xtensio tools, it can and should be repurposed, revisited, and revised to suit your evolving needs. You can always add, delete, and move your modules and sections around with Xtensio’s versatile editor to adapt the invoice as you need it and anyone with the link will see the most recent updates.